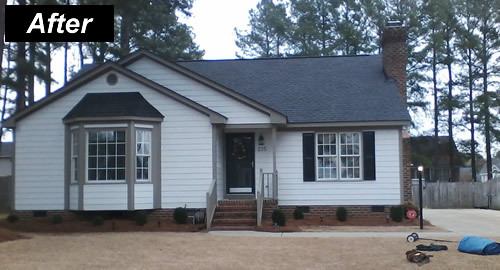 Carolina Roofing & Gutters is committed to providing high-quality asphalt shingle roofing in Enfield NC. In addition we strive to give our customers old fashioned southern customer service. We want YOU to be 100% satisfied with your new roof. An old roof looks bad. Asphalt shingles age over time and are more likely to leak during the heavy rains that we get in North Carolina. If your asphalt shingle roof has endured several years or has been through a significant hail storm, it could be time to replace it - see: What you need to know about asphalt shingle roofing. 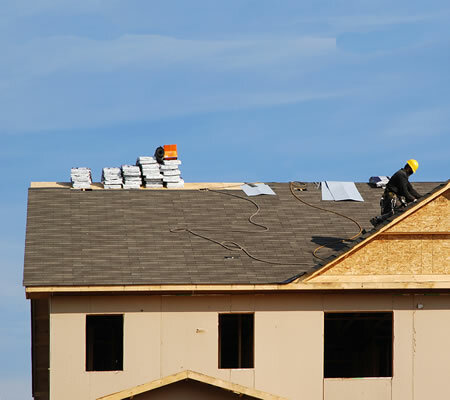 We are a dependable roofing contractor with a great roofing replacement crew. We pledge to you that we will treat your home the way we would treat our own house. Asphalt Shingles - we can install an original asphalt shingle roof or we can do a replacement of any asphalt roof. We use the highest quality shingles: Owens Corning or GAF Timberline shingles. Metal Roofing - we use metal roofing materials from Union Corrugated, one of the leading metal roofing companies in the world. Asphalt shingles are by far the most common type of residential roofing material used in Enfield NC. Most asphalt shingle roofs are supposed to last for 20 years, but some of these roofs simply do not last. Extreme temperature changes can age asphalt shingles faster: if your home is in a location where you commonly experience below freezing weather, then hot summers (over 90 degrees) your roof might age more quickly. In addition to temperature shifts, if you have trees that deposit leaves and small branches on your asphalt shingles you probably need to have a roofer check your roof every 5 years to make sure you do not have points of weakness. If you wait until you see signs of leaking inside your house, you could have hundreds (even thousands) of dollars of repairs. 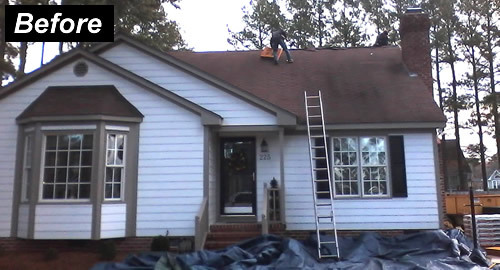 The most common cause of asphalt shingle damage in the Enfield NC area is storm damage. When shingles get pounded with heavy rain and/or high winds (like during hurricane season) asphalt shingles really get tested. During these high rains and winds your roofing is more likely to get falling branches - the combination of all of these conditions can lead to asphalt shingle failure. In addition to shingle failure you must also think about and check the flashing around your chimneys, roof valleys, and the rubber boots around your vents for cracking and leakage. It is also not uncommon for the eaves and fascia boards to suffer aging and wood rot. These are other ways that can indicate that your roof could be near the end of its life. The best way to deal with all of these issues is to have Carolina Roofing to come take a look. We will give you a free inspection and if you have problems we will offer you a FREE estimate. We will give you pricing on both repairs and the cost of a new asphalt shingle roof. You can select the brand and color of shingles. We are happy to work with you. While it is less expensive to layer new shingles on top of an old roof, we recommend avoiding laying. Each layer adds addition weight to your roof which can cause too much stress on your rafters...this can also lead to shingle failure. Another reason complete removal of old asphalt shingles is best is so we catch wood rot or water damage on the roofing platform. Usually we can find possible problems with a quick inspection inside your attic. We will go through the options with you and help you get the right asphalt shingles.